If anybody knows what the collective noun for a group of hammocks is, do let me know. So far we in family Blonde Two have tried ‘a hanging’, ‘a knot’ and ‘a sling’ but are not yet satisfied. We are very lucky to have a hammock expert in our family, Six-Foot-Blonde (son number two) is the author of his own blog www.hammocker.co.uk. It is not often that all five of us manage to get together, so with a count of four assembling in Todmorden over the Easter weekend, the opportunity seemed too good to miss. We walked in to our top-secret destination for about a kilometre. We all knew that for hammocks you needed trees but Six-Foot told us a bit about site selection as we walked. You need to make sure that your trees are the right distance apart (too far apart can mean a flat, precarious bed and to close together can mean a ‘banana-sleep’). You also need to avoid ‘widow-makers’ which are dead trees or branches that might fall on you in the night. Six-Foot insisted that we do most of our setting up on our own, so he allocated trees, tied the important knots and issued a few instructions, then set up his own ‘rig’. We had an interesting time, I had to move a few rogue branches, Not-At-All (only daughter) had to fashion a peg out of a stick and Mr B2, well Mr B2 was all organised before I had even got my hammock out of my bag. The first thing you do when you are hammocking is put your tarp up. The best way to do this is using a ridge line with two sliding prusiks attached to mini-carabiners to tension the sheet. Once your tarp is up, you can do everything else in the dry should it start to rain. 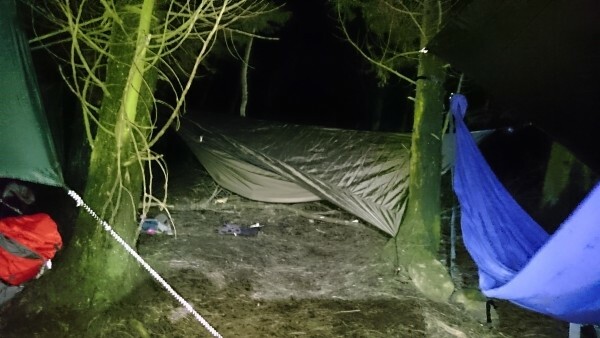 I managed my own tarp in Blonde fashion, one of my guy ropes was tied to a fallen tree and one was pegged; but I did ask for some help with the actual hammock hanging. This involved straps called ‘tree-huggers’ and some knotting that I didn’t quite understand. Once your hammock is up, you have to think about underneath insulation. 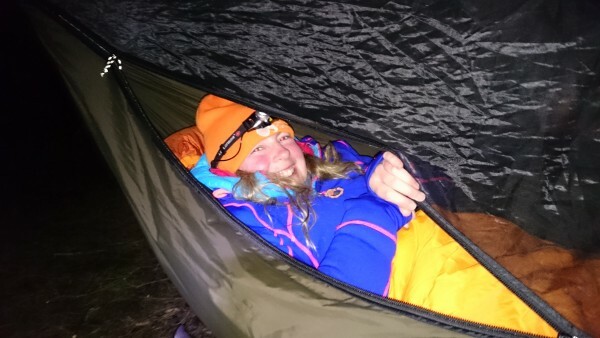 The coldest place in a hammock is underneath you so insulation is vital. 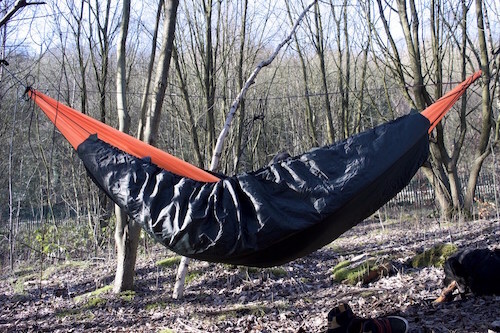 If you are lucky, you have an under-quilt which clips underneath your hammock. My hammock (being a Rolls Royce version for mothers) had two slots into which I slid a couple of Thermarests. The reason that Six-Foot recommended a double mattress was for the width; the most comfortable sleep in a hammock is on the diagonal, this avoids your feet being too high and your back in a funny curve. It takes a bit of getting used to because your natural instinct is to keep to the middle of the hammock as much as possible to avoid falling out. My rig was now looking very comfortable and we had quite an impressive family camp going. All close enough to talk to (and laugh at) each other but with plenty of room for swinging. I discovered later that hammocks don’t swing on their own as much as you might think, luckily mine was near enough to the floor for me to push off with my hand, it was a very soothing motion. I will tell you about the morning tomorrow … it was most unexpected and very exciting! It seems to be quite a lot of faffing to set up so what are the advantages? Now you can do prusiks you should be ok if you fall into a crevasse (assuming you were roped up). Faffing yes, but no more than a tent you haven’t pitched before. 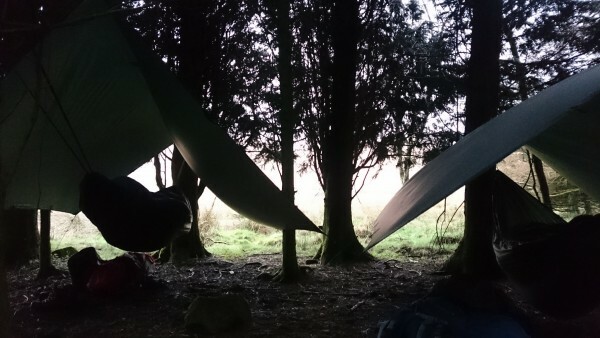 You can hammock even if the ground is uneven, swinging gently is really relaxing and if you are clever (and not a girl) you can wee out of your hammock in the middle of the night. Not such good news on the prusiks, needed some help, but I did re-perfect my bowline sorting out ridge lines. We tenters might all need hammocks one day, if Britain is re-wolved; but perhaps not too close to the ground!